MLM NEWS BLOG: Latest update about Nmart operations! It has been a bad time for the Nmart associates all over the country after the appeal is released from Nmart management. Though Nmart has been doing well during the past period, the challanges faced with respect to stock availability, meeting with regulations, compliances, etc., has forced the business to a halt for sometime. But sometimes, a halt is good for any business which has a long vision. 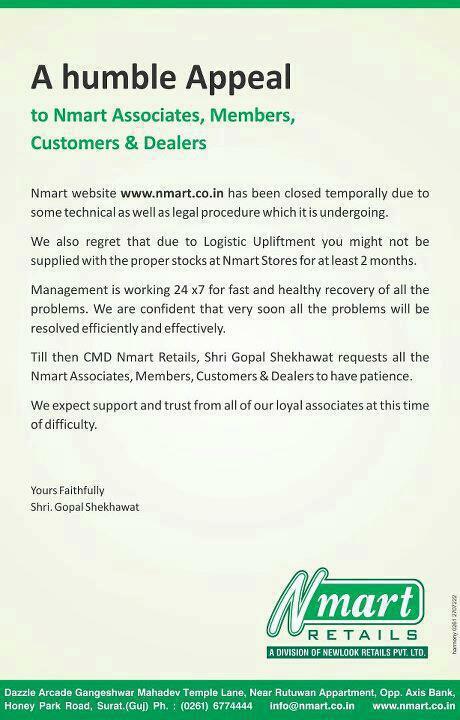 We hope that Nmart will recover from these challenges and come back to operations very soon. Below appeal has been released from Nmart. All Nmart leaders now has no options left than to keep their fingers crossed and wait patiently until they hear for a good news from the Nmart management. Why is there no date for this letter? WELCOME ALL NMART LEADERS IN TAMILNADU TO JOIN RMP, THE NO.1 INDIAN COMPANY IN THE NETWORK MARKETING IN THE THE WHOLE WORLD. THE ONE AND ONLY COMPANY WHERE THE MONEY YOU INVEST YOU GET THE PRODUCT IMMEDIATELY. LATEST NEW HYBRID PLAN LAUNCHED. EARNING POTENTIAL FROM RS. 1000/- TO RS. 1,30000/- PER MONTH. FICCI MEMBER, RBI REGISTERED, ISO 9001:2008. REGD OFF CHENNAI. TO JOIN GET IN TOUCH WITH ME @9840875567. WHY YOU ARE NOT JOIN MY RECHARGE HAVING 94 CRORE PEOPLE ARE WAITING TO INSTALL COMBO SIM WITHIN NEXT 3 YEAR WITH 100% TRUE VALUE PRODUCT i.e. MOBILE/DTH/DATA CARD RECHARGE. JOINING Rs.1800.00 AND GET Rs.100.00 RECHARGE FOR NEXT 18 MONTH. i must say, you should quit my Nmart right now, tu nahi teri yaad sahi. you are into a new business, do it properly, but without dragging us. RMP ka product dekha hun.800/- ka product 8000/- me sell kar rahe hain. r m p is not a good company.. they selling the product which is not worth..
nmart plan is very good plan in all mlm company but some ligale problem facing nmart so co-oprate nmart................nmart is back again wait and watch.----------------------cmd sir nmart jaldi chalu kijiye aur DUNIYA KO DIKHA DO NMART KA DABANG. cmd sir ne to abtak kisi ko welcome tak nahi diya..
my down line says: when it will open? really scarred to answer these questions. THIS IS A FACK COMPANY,PL. JOIN THE NEW COMPANY REQ. TO ALL MEMBER. Are you looking for Online Part-time jobs along with your regular job ? 1. Join Spicetomail.com for Free & Get Rs.100 as Instant Bonus!! 2. Earn Rs.500/- by Just Reading their advertisement E-mails and SMS Daily. 3. Refer your Friends & Get commission Upto Rs.300/- for your Friend's referral too. 4. Get Your Earnings Every Week by Cheque. Imagine what it will be a huge force, if will be the union of network users. And if this force will be to improve the welfare of each. What opportunities are opening before us. namrt 26 jan 2013 ko khulega...lekin wah jan 26 kaha gaya namrt ka jhutha wada kab tak karega? nmart k CDM mr gopal sekhawat jab v app ka mll khulega to kiya customer ko pure intrest k sath paisha wapas karoge? jabab dijiye mr gopal ji. nmart kya dub gaya kab khulega kisi ko pata hai ? nmart kabhi nahi khulega, Gopal aur management team paisa kha geya, Bnak ac me paisa nahi hai, islie bank ac khulne ke lia koi case nahi hua. Hal cherona bandhu!Barang kantha charo jore!Tomay amay dekha hobe natun diner vore.Instead of saying goodbye let us hope for something good! Please listen,..Nmart is not coming back!!!!!!!!!!!!!!!!!!!! for me. In my opinion, if all website owners and bloggers made just right content as you did, the internet will likely be much more useful than ever before. "No nation was ever ruined by trade." by Benjamin Franklin. Now the time to grab a stable platform where u can achieve your dream. "LIFE CARE" is well established brand of north India from 2008 with quality products and best plan in market. This piece of writing will assist the internet people for building up new weblog or even a blog from start to end. Nmartko khulna chahiy Qki Eske Sistam me etna Dum haiki caroro Admika Swapna Sakar kar sakta hai. keep visit www.nmartco.blogspot.com and www.nmartlatestinfo.blogspot.com for latest updates. nmart is not paying loyalty bonus of Rs.11000/ to the members who have completed 4 years, but delaying and requesting them to wait, actually they are collecting more and more money before final closure. their owner are growing not the associates, however retailers are also in good position but investors have been cheated. plz be aware, no one will get Rs 11000 after 4 years except a few, to advertise the scheme. yes, you are right, all will not get back their money as promised, this is what happen in all the binary schemes, Govt is planning to ban all such fraud schemes, nmart is also in the list. It is not sufficient to ban such schemes and Companies but to initiate stern action against the fraudulent companies to return/refund the investors money with all dues. It is the duty and responsibility of the concerned Department to take necessary action against those companies and punish them . That is what we, as investors expect from Government. Dear all nmart associates both the cases related to bank account WP/6982/2013 and website WP/6981/2013 has been adjourned. Again it has been listed in the daily cause list before HON'BLE JUSTICE C. PRAVEEN KUMAR in court no. 24 on date Monday 26th August, 2013. What is the latest position after 26.08.2013. Please inform the development. Please open at least 2 retail out in each state, to en cash coupons - gift vouchers. Furnish list of retail out /shops functioning with full address so that the investors can utilise the services.